Although the weather has remained warm, my running has improved over the past week. The speed workout in Tuesday evening went better than any of the earlier speed runs in this cycle, as I ran the prescribed paces without too much trouble. 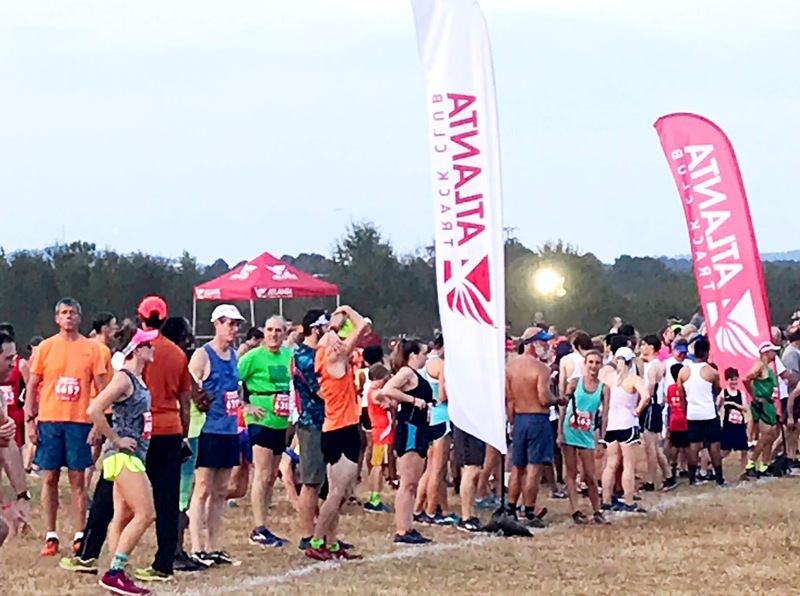 Thursday evening I ran on a nice new route through Decatur with the Big Peach Running Company, taking the route a little faster than expected, but knocking out 5 miles at a 10:01 min / mile overall pace, thanks to speeding up for a 9:20 minute final mile. 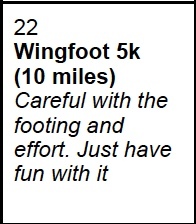 I ran the Wingfoot Cross Country 5K a couple of years ago, when it was a morning race under pleasantly cool conditions. 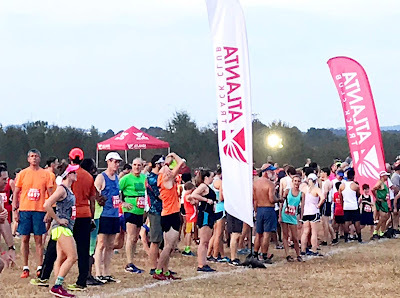 Last year, the Atlanta Track Club turned the event into an all-day cross-country meet, concluding in the evening with a Community 5K. 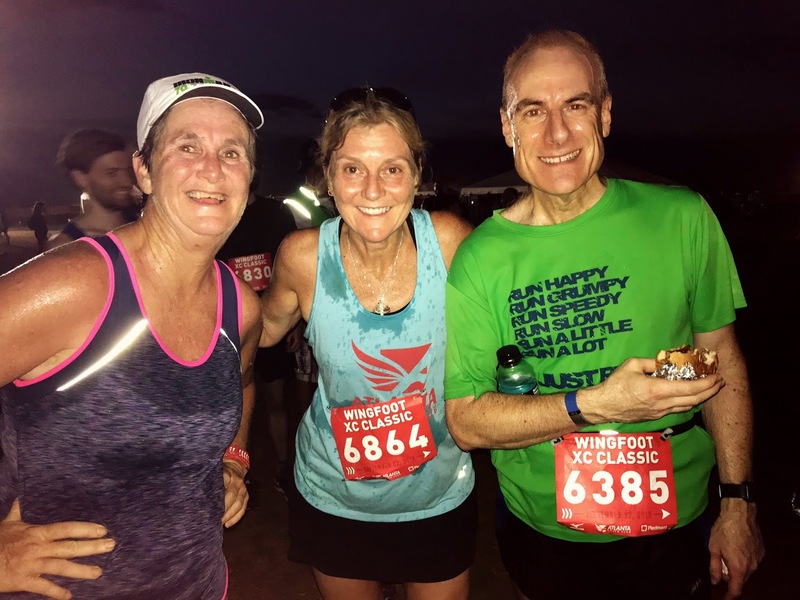 I missed this race, as Bonnie and I were on a weekend trip to New York City for her high school class reunion. After my difficulty in the Monday Nighter 10K in June, a hot evening race, I wasn't looking forward to another warm evening race. 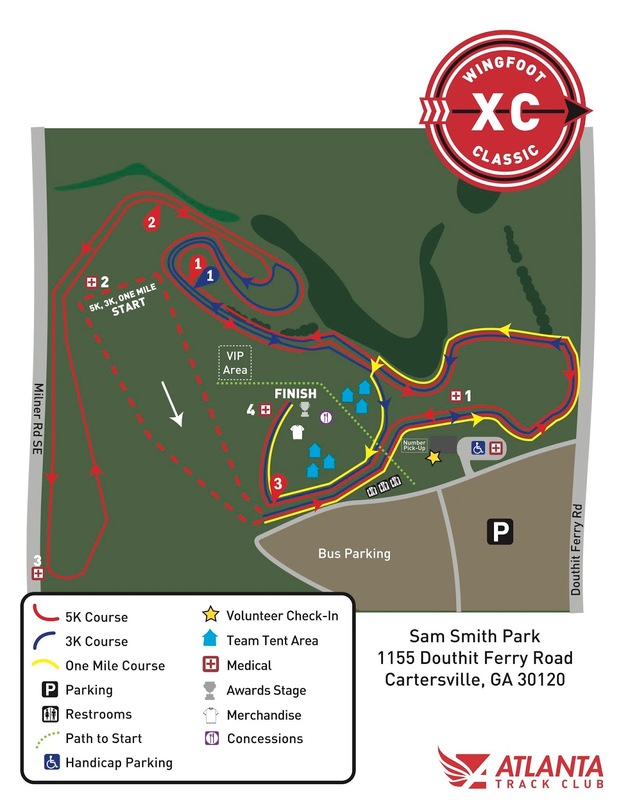 But I've completed all of the Atlanta Track Club Grand Prix events to this point in the year, and with today's race and the 10-Miler in late October, I'll get a little award for completing all of the races in the series. Bonnie and I drove up to Cartersville, arriving about 2 hours before the start of the race, plenty of time for me to get in 7 easy miles before the 5K race. Even though the temperature was 90 deg F, I felt fine throughout the run, thanks to hydrating throughout the day, and bringing plenty of water on the run. I found a nicely shaded gravel trail around Dellinger Park for the middle part of the mileage. At one point I came across a group of 8 - 9 deer. I tried to run quietly and smoothly past but most of the deer bounded into the safety of the trees, except for a young buck that stared me down, as I ran past taking care to remain on the gravel path, and staying off his turf! I began to run madly across the field. However the field wasn't completely even, and so I decided to slow down a little, to ensure that I didn't take a bad step on the crushed corn stalks covering the ground. 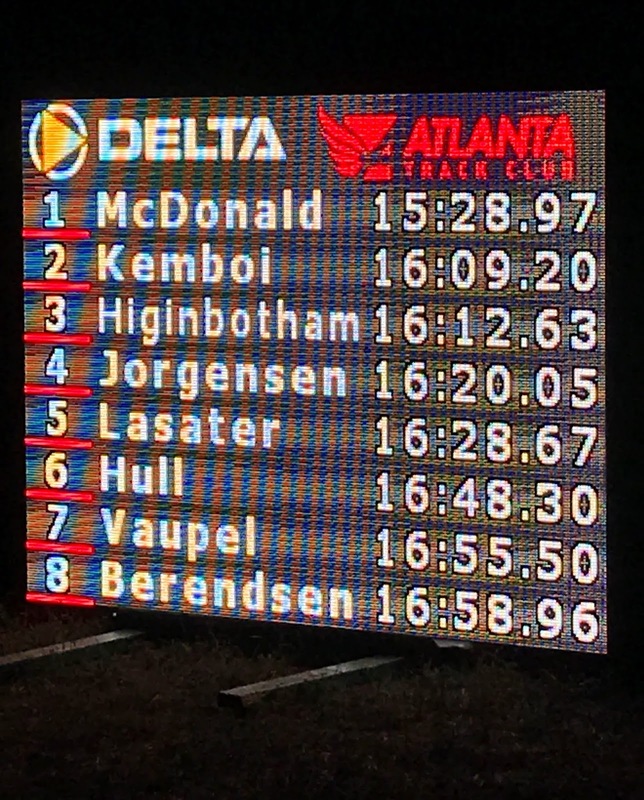 Nonetheless near the bottom of the field, I took a quick look at my watch: 7:06 min / mile pace. Oh well, I felt really good and strong, and decided to keep pushing forward. Might I run a 23 minute 5K this evening? Let's see. I started passing people as we ran the lanes criss-crossing the field. Shortly before the 1-mile mark, we bounded across three rows of hay bales - no problem. Bonnie called out and I gave her a smile and a thumbs up, as I accelerated past a few more runners. I reached a timing mat at mile 1 at 8:00 even. 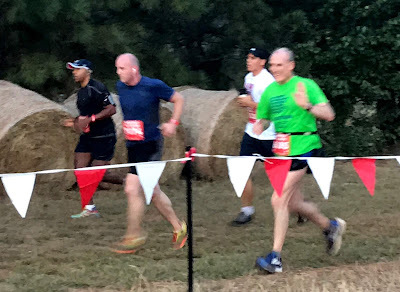 I was still racing across the field, feeling strong and fast, until about 11 minutes in, when the cumulative fatigue of 8 miles for the evening finally caught up to me. I felt myself slow down, as a few people that I had passed a moment before caught up to me. Oh well, this is a learning experience, no harm done, just don't do this in the marathon 6 weeks from now. Nonetheless I didn't let myself take a walk break, I kept pushing as best as I could. Crossing the timing mat for mile 2 at 17:00 even, I realized that I had really slowed down! About 21 minutes in, I started to push myself to speed up a bit, but I couldn't maintain speed for more than a minute, dropping back down. Then the band began playing "What a Wonderful World" and I started to speed up again. The finish line must be coming soon, I thought, then a volunteer called out "Only 400 meters to go!" That was at least 300 meters more than I had expected, and I found myself slowing again. As I passed the 3 mile marker at 26:40, the band switched to ZZ Top's 70's hit "La Grange". Now I could see the finish line, and I forced myself to speed up, even though we were going uphill. Finish time: 27:42, just under a 9 min / mile pace overall. I was parched and completely out of breath, but after a bottle of water, a bottle of Powerade, and most of a barbecue chicken sandwich, I had recovered. Unfortunately my legs were really sore from the effort and tightened up on the hour-drive home. Nonetheless, the event was a lot of fun and definitely worth the drive. Although I didn't run the race very strategically, it felt good to push myself in a race, after a long summer of overly cautious running. and a barbecue chicken sandwich in my right hand! 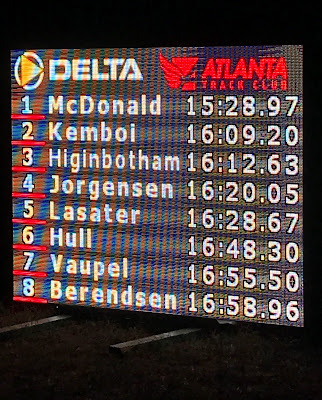 Another McDonald won this race!